This is a progression course and follows the full range of single and multi-stage techniques associated with using a range of core materials to produce sandwich structures with pre-preg materials. This course is suitable for anyone involved with processing pre-preg and core materials to produce strong lightweight parts, including pre-preg laminators, technicians, supervisors, engineers, designers, researchers and managers. This course is suitable for anyone involved with processing pre preg and core materials to produce strong lightweight parts, including pre preg laminators, technicians, supervisors, engineers, designers, researchers and managers. You must have previously completed the course DMSC54, (pre preg laminating – Stage 1) as there is only a 30 minute recap of the stage 1 course. We cover approximately 31 hours of practical and 9 hours of new theory and technical demonstrations. Building on what was covered in our stage 1 course, the focus now moves onto core materials. 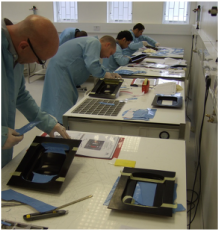 At the start of the course you will address core identification, orientation and core splicing. 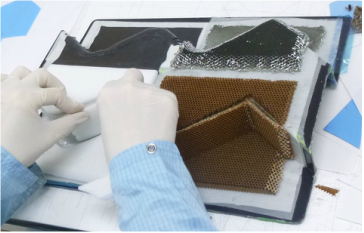 You will produce your parts using Nomex and aluminium honeycomb, foam and syntactic cores. Attention to detail is vital as you will need to produce templates, trim, chamfer and fit the core materials. Multiple stage curing of your parts and vacuum de bulking will be covered through the course. From a single stage cure to a 3 stage closed mould cure, you will see how the curing process effects the quality of the components. As composite parts can be scrapped at any point in the manufacturing process, being methodical and organised will greatly improve the quality of the components produced. You will be guided through the processes and given support throughout the week, inspecting all the parts produced and assessing the causes of any underlying defects. During the course you will complete 4 practical tasks, 3 training tasks and 1 assessment task. This is a fast paced course. As you will have a good grounding from DMSC54, pre preg stage 1, the laminating time and vacuum bagging time is significantly reduced. This allows you more time to develop your skills by producing parts with cores and sandwich panels. The final training task addresses pre preg skin preparation and the use of inserts with core materials. At the end of the week you will complete a practical assessment task along with a written test. This course will give you good understanding of pre preg sandwich structures and hands on experience working with a range of core materials, commonly associated with pre preg.